Karen Kostiw, dual licensed in New York and New Jersey, is a Real Estate Salesperson at Warburg Realty, a real estate brokerage with over 100 years of experience and recognized for providing its clients with a higher level of service. Karen’ extensive background in real estate and finance allows her to uniquely understand her clients' needs and concerns in today's fast-paced market. As a former financial services executive with extensive team-building and negotiation experience, Karen has the proven ability to meet and exceed her client's goals. Karen was raised on the North Fork of Long Island and has resided and worked in Manhattan since graduating college. Karen is currently living in the Chelsea neighborhood with her husband who is also in the real estate profession as a private lender and developer in the tri-state area. Karen is a New York Cares Kaplan SAT tutor and a SIFMA Invest Write Essay Judge. She enjoys the arts, cooking, playing her flute, running, playing tennis in Central Park and exploring different neighborhoods and restaurants within the five boroughs. I explain the pros and cons of each transaction to potential customers in a way that is informative and not overbearing. My background in mortgage finance managing multi-million-dollar transactions affords me valuable project management and problem solving skills that help my clients fulfill their real estate dreams. Being the first agent to close at 100 Barclay, a new development originally designed by renowned American architect of the century, Ralph Thomas Walker who applied his Beau Arts training to design one of the most beautiful buildings in Manhattan. My client purchased two units in this building as an investment. 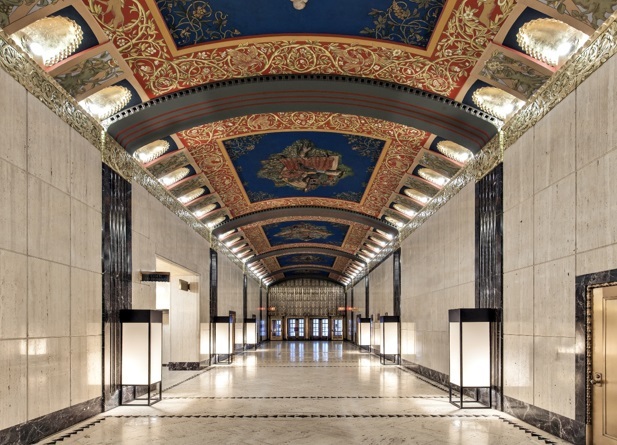 The landmarked lobby is depicted below. I am tenacious and a constant learner. Although I have a tenured background in mortgage securities, I am always learning something new. The real estate market, laws, taxes, design landscape, and people’s tastes are ever-evolving. So many complexities can arise for buyers and sellers related to 1031 Exchanges, EB-5, seeking a mortgage commitment, inspection, or a renovation they are not prepared for that require constant professional guidance and support. Making a difference by helping others achieve their dreams and become their best selves. Someone told me once, I am simply a “Helper,” -- I provide guidance to clients’ in purchasing and selling one of their biggest assets, as well as guiding them through the ebbs and flows of seeking and transitioning into a new job in an ever-changing employment landscape. Understanding the difference of what customers say they want and what they really want in aims of satisfying their emotional and financial real estate plans. It’s not easy to have a single motto. I refer to a motto depending on the inspiration needed for the situation. Recently I came across this motto, which I like since it neatly captures life’s moments. "It doesn't make you a failure to get knocked to the mat, because everyone gets knocked to the mat. You're a failure only if you stay there. To be a champion all you have to do is get up and fight just one more round. All you have to do it fight one more round." People who exude a positive energy and are willing to collaborate and learn together to achieve what others may deem impossible. Happiest with my feet in the sand at the beach reading a good book or magazine with lots of sunscreen. I grew up on Long Island and have lived in Manhattan since college, so I tend to gravitate towards farms and water. Every year my husband and I visit the East-End of the North and South shores of Long Island, and Playa Mujeres in Mexico to drink frozen lime Mojitos, listen to the glistening waves and smell the salt of the water spraying in the air. Water -- I was born under the water sign of Cancer and operate from my instincts and emotions. Life can be hectic, and water gives me joy and a sense calm. My consumer indulgence is building upon my haute-couture Roger Vivier shoe collection, the epitome of beauty and glamour, known as the “Fabergé of Footwear". Roger Vivier studied sculpture at the École des Beaux-Arts in Paris and apprenticed at a shoe factory, setting the stage to become the most innovative shoe designer of the 20th century. His designs were worn by the iconic and stylish Audrey Hepburn. I am the oldest of six children and aunt to many wonderful nieces and nephews – I have always had a passion for exploration and uncovering hidden gems. It could be the woods, the beach, an empty new development, or an attic or closet in an old the house. I continue to explore the road less traveled to find a new food restaurant, an upcoming area or new apartment that I can share with others.